Who invented Lego? The name of the person credited with inventing Lego is Ole Kirk Christiansen (1891 - 1958). Ole Kirk Christiansen is not only famous as the Dannish inventor of Lego but also as a carpenter, toymaker, entrepreneur and businessman. When was Lego invented? Ole Kirk Christiansen invented Lego in 1949, during the Cold War period of invention. The invention of Lego originated in Denmark and is considered a significant addition to the field of Toys and Games. Definition of Lego: Lego is defined as a popular construction toy consisting of colored, interlocking plastic building bricks, and other standardized components, that fit together with studs. Fact 1: Who invented Lego? Lego was invented by Ole Kirk Christiansen in 1949 during the Cold War era of inventions and great addition to advancements made in the area of Toys and Games. It is enjoyed by kids and adults alike. Fact 2: Who invented Lego? Prior to the invention of Lego in 1949, there were wooden construction toys and mechanical model construction systems consisting of miniature metal or plastic parts but none had the appeal and versatility of the colorful lego bricks. Fact 3: Who invented Lego? The invention of Lego was made possible by the invention of Plastic by Leo Baekeland in 1907. Plastics can be colored or shaped and the durability of the material made it perfect for the manufacture of Lego. Fact 4: Who invented Lego? The inventor of Lego, Ole Kirk Christiansen, was born on April 7, 1891 in Billund Municipality, Denmark and died on March 11, 1958. Fact 5: Who invented Lego? The early years of Ole Kirk Christiansen were spent in Filskov, a small village north of the Danish town of Billund, where he was raised by his impoverished family. Ole Kirk Christiansen only received a basic education and left school to start earning some much needed money. Fact 6: Who invented Lego? Following his education his first job was as an apprentice carpenter working for Kristian Blonde Christiansen. He completed his apprenticeship and with experience he eventually became a master carpenter. He married Kirstine Sørensen and the couple went on to have four sons, Johannes Christiansen, Godtfred Kirk Christiansen, Karl Georg Kirk Christiansen and Gerhardt Kirk Christiansen and a daughter, Ulla Skov. Fact 7: Who invented Lego? Ole Kirk Christiansen purchased a small shop in Billund and in 1932 set up a carpentry and woodworking business producing small items of furniture. Christiansen used left over pieces of wood to make toys for his children. One of the toys was a a small wooden duck, which became a favorite with the children. Fact 8: Who invented Lego? He decided to put the wooden toy ducks into production which eventually became more popular than his small items of furniture. He extended his range of wooden toys and in 1934 changed the company name to Lego. The word derived from Danish phrase 'leg godt' (LEg GOdt) meaning to "play well." Ole Kirk Christiansen later found out that the word meant "I study" or "I put together" in Latin. Fact 9: Who invented Lego? In 1942 his third son Godtfred Kirk Christiansen (July 8, 1919 – July 13, 1995) began working alongside his father. The Lego premises burned down in 1944, losing all of the stock. By 1947 the business was up and running again but the focus of the business this time was on making wooden toys. Fact 10: Who invented Lego? Children were particularly attracted to bright colors and in 1948 Ole Kirk Christiansen invested in a plastic molding machine for the company, the first of its kind in Denmark. Using plastic he made a range of small plastic bears and rattles. Fact 11: Who invented Lego? The company began to produce both plastic and wooden toys. One of the favorite toys were "Lego Blocks" that were made out of wood. 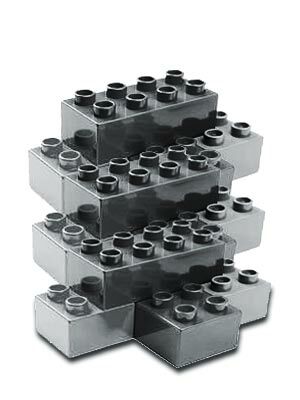 In 1949 the now famous interlocking plastic Lego bricks began to be produced. The colorful plastic bricks had several round "studs" on top with a hollow rectangular bottom - and the bricks could be 'locked' together. Fact 12: Who invented Lego? By 1950, Christiansen’s son, Godtfred Kirk Christiansen was named Junior Vice President of the company began to realize the huge potential in Lego bricks to become a system for creative play. Fact 13: Who invented Lego? By 1953, the company began to sell and market complete plastic block sets, and in 1954, they obtained a trademark for the product, which they called "LEGO Mursten" or "LEGO Bricks." Fact 14: Who invented Lego? In 1955 launched the "LEGO System of Play" that featured the idea of a line of related products that could be used to build a whole community with the Lego Town Plan that could be built and rebuilt on a plastic board, using the child’s imagination. The Town Plan sets also came with pre-manufactured cars to drive around the town. Fact 15: Who invented Lego? In 1958, the modern brick design was developed to improve the locking ability and versatility of the original bricks and the company patented the "stud and tube locking system" on January 28, 1958. Fact 16: Who invented Lego? Ole Kirk Christiansen died shortly after from a heart attack at the age of 66 on March 11, 1958. Ole Kirk Christiansen will always be remembered as the inventor of Lego. Fact 17: Who invented Lego? Godtfred Kirk Christiansen became the head of the company and in 1960 bought out his three brothers to become sole proprietor of the business. The bricks were introduced to the United States in 1961. Fact 18: Who invented Lego? In 1967 a larger version of the blocks, named DUPLO, were added to the range, designed for toddlers and younger children. Fact 19: Who invented Lego? In 1968 LEGO opened a theme park in in Billund Denmark, based on the concept of their plastic toy bricks. Other theme parks opened in Windsor, England in 1996, in Carlsbad, California in 1999 and in Gunzburg, Germany in 2002. Fact 20: Who invented Lego? Godtfred Kirk Christiansen died from Lou Gehrig's disease on July 13, 1995. Fact 21: Who invented Lego? Ole Kirk Christiansen’s grandson, Kjeld Kirk Kristiansen, later became CEO of the company until October 2004 when he was replaced by the company’s first non-family chief executive.